Violent Storms Threaten More Damage To States Torrential rain and tornadoes that carved across the nation's midsection left at least seven people dead in Arkansas and threatened to swamp parts of Missouri. Severe weather systems are expected to bring more pain to hard-hit areas. Emergency workers pulled residents of the Oak Glen Residential Community in Johnson, Ark., to safety after a nearby creek flooded its banks. At least 100 homes in the East Texas town of Edom were damaged Tuesday night, and a woman was injured when her mobile home was destroyed, officials said. There were also minor injuries reported in Louisiana when an oil drilling site turned over in high winds. In southwestern Michigan, nine people were sent to the hospital, one with serious injuries, when lightning struck a park where children and adults were playing soccer, police said. The latest round of storms began as communities in much of the region struggled with flooding and damage from earlier twisters. In Arkansas, a tornado smashed Vilonia, just north of Little Rock, on Monday night, ripping the roof off the grocery store, flattening homes and tossing vehicles into the air. At least four people were killed. There are actually a couple 18-wheelers that were just blown off the road, turned upside down. ... But the tornado that came through here flipped those around like matchbox cars. "The town's gone," Vilonia resident Sheldon Brock said outside a gas station a few miles from the town. Stephan Hawks, a spokesman for the sheriff's office in Faulkner County, where Vilonia is located, said a roof was blown off the local grocery store and power poles snapped like toothpicks. Rescuers were looking for survivors in the wreckage. "Right now, just in the town, there are 14 to 16 houses that have been destroyed," Hawks said. "We're not real sure where those people are. We don't think they're in the houses. We're trying to locate them, approximately 50 to 60 people. "A big hindrance, I'm afraid, is the 80 percent chance of storms we're going to get this afternoon. They just keep on coming," he added. Tommy Jackson, a spokesman for the Arkansas Department of Emergency Management, said people were racing to prepare for the next round of severe weather, "but there'll be many, many volunteers there helping out their fellow residents." In Missouri, a storm-strained levee protecting the town of Poplar Bluff threatened to give way Tuesday. People in Poplar Bluff were "living inch by inch, hour by hour," said Deputy Police Chief Jeff Rolland. It was a miracle that the levee there was still holding back the Black River, he added, though water was spilling over the top in about 30 locations. Just south of the town of 17,000 residents, the levee gave way, spilling thousands of gallons of floodwaters across rural farmland. Rolland said the rupture was easing pressure somewhat on the levee around Poplar Bluff, but he cautioned that the town could still be in danger. "That levee is so saturated with water that it is still very unstable," he said. "Any more torrential downpours could cause it issues also." Poplar Bluff, 130 miles south of St. Louis, was the worst-hit of several areas in the Mississippi and Ohio River valleys threatened by floodwaters. A dam in St. Francis County, about 40 miles south of St. Louis, was also in jeopardy of bursting, and levees strained to contain floodwaters in Pike and Lincoln counties, along the Mississippi River north of St. Louis. Forecasters have said the rain and storms that began early last week and have hammered a swath of the nation's midsection could continue for days in some places. 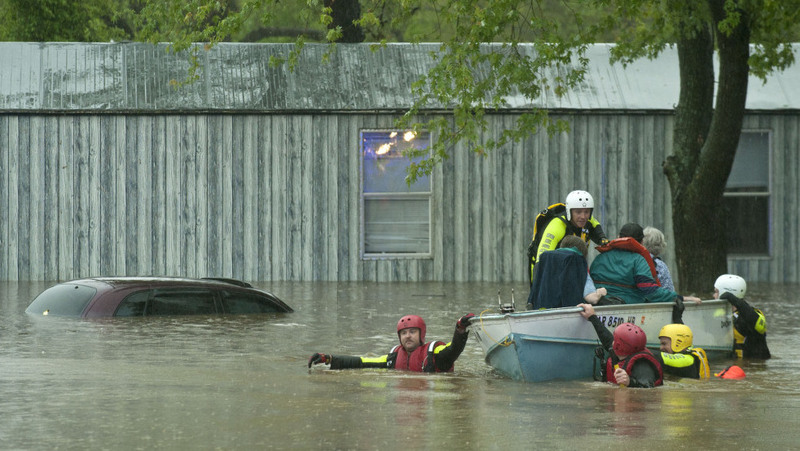 Powerful storms ravaged Missouri, Arkansas, Kentucky, Texas, Tennessee and other states on Monday. In Kentucky, widespread power outages closed many schools and businesses, and thousands of residents were still without electricity Tuesday. Emergency management officials said hundreds of trees and power lines were uprooted after winds overnight that topped 100 mph in some counties. Joe Muncy of Murray, Ky., was out clearing a tree that fell on part of his house. He said he was awakened by the noise just after midnight. "And I mean, I was scared. And of course ... you can't go outside and see what's going on," Muncy said. Governors in both Arkansas and Kentucky have declared states of emergency. In Kentucky, historic flooding is expected over the next few days from the Ohio and Mississippi rivers. Several dozen residents were evacuated near the confluence of the rivers at Cairo, Ill. The U.S. Army Corps of Engineers put off making a final decision on a controversial plan to intentionally breach the Birds Point levee in southeast Missouri, just downriver of the confluence. A breach would soak 130,000 acres of farmland, and Missouri Gov. Jay Nixon objected to the idea.